CRÉPEAU, AURÉLIE (baptized Aurélie-Éléonore), named Mother Youville, teacher, and founder and superior of the Grey Nuns of Nicolet; b. 30 March 1833 in Sorel, Lower Canada, daughter of Médard Crépeau, a butcher, and Geneviève Hus-Lemoine; d. 21 Dec. 1910 in Nicolet, Que. At the age of 26 Aurélie Crépeau chose the religious life, joining the Sisters of Charity of Saint-Hyacinthe on 26 May 1859. She made her profession two years later under the name Sister Youville. Thus she became a Grey Nun, the name commonly given to members of her order, which had been founded in 1737 in Montreal by Marie-Marguerite d’Youville [Dufrost*]. The community had been carrying on its work in Saint-Hyacinthe since 1840, was self-governing, and maintained the traditions of the mother house. From the beginning Sister Youville shared in the multiple labours that went with service to the poor, and also served as the community’s annalist. The latter task was no sinecure. She had no written records to rely on in writing the history of the institution. 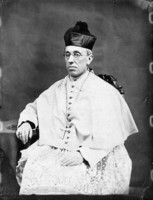 The archival materials had been borrowed by Bishop Ignace Bourget* of Montreal for a study and had disappeared in the fire that burned down the bishop’s palace in 1852. In addition to being annalist, Sister Youville was counsellor and then secretary general from 1869 to 1886. In 1886 Elphège Gravel, the first bishop of the new diocese of Nicolet, asked for some Grey Nuns to open the way for charitable work there on the understanding that their endeavour would be self-governing from the outset. The project, which had an appeal for the sisters, was debated and finally accepted. It meant a definitive separation from the centre where they had been trained. Bishop Louis-Zéphirin Moreau of Saint-Hyacinthe chose Sister Youville to found and direct the new community and appointed three nuns as her assistants. Mother Youville came to Nicolet empty-handed. One of the first gifts she received was seven cents offered her by a destitute woman. Bishop Gravel, the man behind the venture, tried to recruit benefactors to help the nuns. He even went to France to bring home Abbé Jules Paradis, who provided the substantial donation that made it possible to begin building the first Hôtel-Dieu. 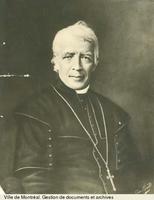 Abbé Paradis would be one of the first to enter the hospital in 1889 and he was to die there the following year. In 1889 the establishment, which also took in the elderly, the poor, and orphans, received its first 26 inmates. Meanwhile a noviciate had been founded to ensure the continuity of the community. In 1893 Mother Youville was even able to send some nuns to work among the Blackfoot in the District of Alberta; there they assisted Father Albert Lacombe*, opening two boarding-schools and a hospital. Mother Youville was a woman bursting with energy. She found indirect means in the community to support the sisters’ work. After she set up the Association des Dames de Charité, the local people provided everything for the nuns. The most faithful benefactors were to be found in the association’s ranks. Without neglecting the inmates of the hospital, whose numbers constantly increased, Mother Youville made home visits, attended those near death, shrouded the dead, and tended the sick during epidemics. She also continued her work as annalist, filling six registers in a rapid, plain hand. She had a flowing, natural style, and if her account was wordy and somewhat incomplete, it was exact. Her concern for accuracy and for administrative needs, as well as her desire to record the community’s history, led her to put down the smallest details. 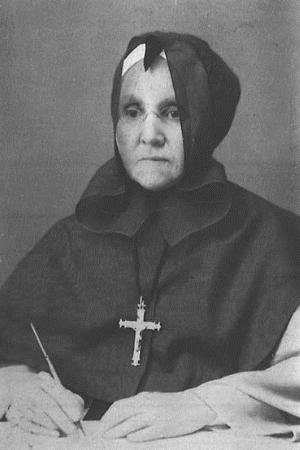 Mother Youville was superior general of the Grey Nuns of Nicolet from 1886 to 1897, and again from 1900 to 1903. In the interim and until 1910 she held the offices of assistant and secretary. By then there were 359 people in the Hôtel-Dieu of Nicolet. Five houses subordinate to the mother house had been founded. The hundredth Grey Nun was admitted to the noviciate on the day Mother Youville died, 21 Dec. 1910. An attractive woman who was energetic and determined, she was above all a Sister of Charity with a deep love for the poor. The most important documents on Aurélie Crépeau are published in M.-C. René, Sœurs grises nicolétaines; mère Youville (Aurélie Crépeau); ses auxiliaires; son œuvre (Trois-Rivières, Qué., 1948), and in Les Cahiers nicolétains (Nicolet, Qué. ), 8 (1986): 43–143; this issue of Les Cahiers nicolétains is devoted entirely to the Grey Nuns of Nicolet. Aurélie Crépeau’s baptismal act is at ANQ-M, CE3-7, 30 mars 1833. Marie-Carmen René, “CRÉPEAU, AURÉLIE, Mother Youville,” in Dictionary of Canadian Biography, vol. 13, University of Toronto/Université Laval, 2003–, accessed April 22, 2019, http://www.biographi.ca/en/bio/crepeau_aurelie_13E.html.